Henry J. 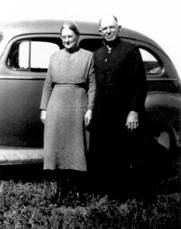 Harder: pastor of the West Zion Mennonite Church near Carstairs, Alberta, was born at Latham, Missouri, on 26 November 1881 and died 31 May 1961 at Colorado Springs, Colorado. Bernice (Devitt) Harder (23 May 1883 - 17 September 1945) was a pioneer city mission worker prior to her marriage to Henry Harder on 27 October 1920. Henry Harder attended public school and a Baptist Academy in Missouri and later attended Goshen College. He was ordained to ministry in the Mount Zion Mennonite Church near Versaille, Missouri, in 1906. He was also a teacher in Missouri, and served from 1909 until 1920 as Secretary-Treasurer of the Missouri-Iowa Mennonite Conference Mission Board. After marrying Bernice Mae Devitt in 1920, Henry Harder served briefly as Superintendent of the Mission Sunday School in Los Angeles before moving to a farm east of Didsbury with Bernice's parents. They lived there until 1924 when they moved to Didsbury where Henry worked as a skilled carpenter. Henry Harder became secretary of the Alberta-Saskatchewan Mennonite Conference in 1922 and was called to serve as the pastor of the West Zion Mennonite Church after the departure of Noah and Sarah Weber in 1923. His leadership style was gentle and soft-spoken, but based on a strong faith and love for the work of the church. He earned his living as a skilled carpenter, and was very much involved in the construction of a new church building for the West Zion Mennonite Church in the early 1930s. When parts of that building were renovated later, those involved were amazed at the innovative use of scarce or damaged materials which was a great help in the desperate economic conditions of the early 1930s. Bernice Harder was a vivacious and dynamic person who provided enthusiasm and strong leadership. Prior to marriage she assisted in opening the Toronto Mennonite Mission and graduated from Toronto Bible Training School in 1911. With S. F. Coffman's encouragement, she did some Bible teaching in congregations in Alberta in 1912. She also assisted T. K. Hershey in starting the mission in Youngstown, Ohio. Immediately prior to marriage she worked in the Kansas City Children's Home. After marriage as a pastor's wife at West Zion she provided leadership in the congregational women's sewing circle and in women's meetings at the annual conference business and devotional meetings. When her health declined the Harders moved to Ontario in 1944, where she died in 1945. Henry then did some short term mission work in Puerto Rico before returning to Alberta. When his health failed in 1959 Henry Harder went to live with his sisters in Colorado Springs. There he suffered a stroke in 1960 from which he never fully recovered. He died of pneumonia in 1961. Harder, Richard, ed.West Zion Mennonite Church: Centennial Scrapbook, 1901-2001. Carstairs, Alberta : West Zion Mennonite Church, 2000. Stauffer, Ezra. History of the Alberta-Saskatchewan Mennonite Conference. Ryley, Alberta: Alberta-Saskatchewan Mennonite Conference, 1960: 67. Regehr, Ted D. "Harder, Henry J. (1881-1961) & Bernice Devitt Harder (1883-1945)." Global Anabaptist Mennonite Encyclopedia Online. December 2003. Web. 20 Apr 2019. http://gameo.org/index.php?title=Harder,_Henry_J._(1881-1961)_%26_Bernice_Devitt_Harder_(1883-1945)&oldid=143292. Regehr, Ted D. (December 2003). Harder, Henry J. (1881-1961) & Bernice Devitt Harder (1883-1945). Global Anabaptist Mennonite Encyclopedia Online. Retrieved 20 April 2019, from http://gameo.org/index.php?title=Harder,_Henry_J._(1881-1961)_%26_Bernice_Devitt_Harder_(1883-1945)&oldid=143292.